As you might have noticed, I tend to travel quite a bit through my blog, so when ASOS popped up with an opportunity to put together a post with American Tourister I thought it'd be perfect to tie in with a post on what I like to wear when I'm on the go. I'm off to London again next week on a press trip so - behold - my travelling outfit. You might be looking at the coat are thinking, 'Are. You. Mad.'? but as I'm just there overnight I only have hand luggage and it's bloody freezing outside right now. So, long story short, I always wear the warmest coat I can when I'm travelling within the UK at this time of year so that I don't get caught short at the other end; I have the circulation of an OAP and it does not bode well for me to be layerless. I fell in love on the spot when I spotted this coat as it looked so 60s-esque and unusual and - huzzah - WARM. Rob's not a huge fan of it, in fact when I turned up wearing it I was met with a, 'oh for God's sake Amy, you look like a bird of paradise'. Hmm. Sadly it's now on low stock (seems I'm not the only one who thinks it's fabulous) so I've linked some similar ones below! Now, back to my travel outfit. I always wear jeans and a loose top/blouse for comfort - I really want to stress the importance of 'loose' as my phobia of flying means that plane journeys normally involve a lot of hyperventilating and, consequently, sweat. Unless I'm feeling particularly wild I'll usually opt for flat shoes for comfort too (plus I heard they're better for your circulation whilst flying and I am ALL about the safety). Last but not least is the case; pretty important. This one's obviously not hand luggage sized (I know I'm short but even I can't make a small case look that big) but it's perfect for trips when you do have hold luggage. Me and Rob took it to Paris the other weekend and it was an absolute dream, it's super lightweight and it also bends, meaning it doesn't get too damaged when it gets thrown about a bit at the airport. Plus the colour means that, glasses or no glasses, you can spot it a mile off coming down the conveyor belt. 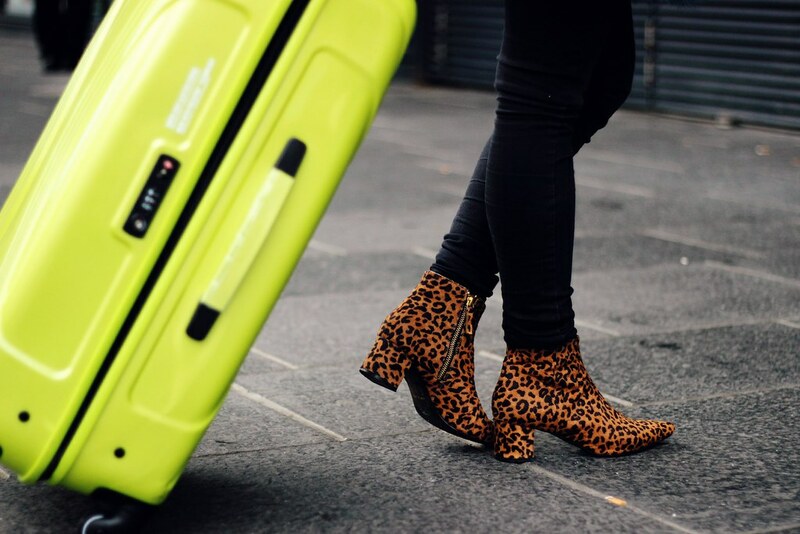 Now, here's the fun part (finally, I know), ASOS and American Tourister have teamed up to giveaway both one of the beautiful cases (which come in lime, pink, purple and navy) and a whopping £100 in ASOS vouchers, perfect for Christmas coming up yes? Check out how you can win big here! In other news, I popped up a new video last night on 5 problems only short people will understand. It's worth checking out if only for the comments below it - I asked everyone to share their short problems/experiences and there's some absolute crackers in there. It's so fluffy I could DIE!! In love with this coat. That faux fur is so cool! Love the shirt too! Your coat is actually the coolest fur coat i've ever seen!! That coat and that suitcase! Wow. I have never seen a coat like this at all but I think its fabulous! This jacket is way to fabulous for me to handle! That fur cost is absolutely amazing! Love the fur coat and the leopard booties a lot! That coat is the best!!! I need something like that this year! Wow, this coat is stunning! This coat is the best ever :)! I adore the clash of patterns with the shoes. You're actually my new favourite style blogger. Just gorgeous!